2018 Indmar Monsoon 6.2L 450 Motor w/ 80 Hours, High Altitude/Torque Prop #2249 15 x 14.25 & Transom Mount Flush Kit, Stainless Turned Down Exhaust, 2018 Malibu Tandem Axle Trailer w/ 14” Aluminum Turismo Wheels, SS Ratchet w/ Retractable Transom Straps, Transom Step w/ Slimline LED, CS Boat Cover w/ TAPS 2 & Skimboard Cover, GL Flip Bimini w/ Surf Storage, Zero Off GPS, Sport Dash w/ Rotary VDC 4-Way Joystick, Wide View Back Up Camera, Malibu Command Wheel, PTM Mirror & Windshield Mount, Power Lift Helm Seat, Soft Grip Flooring - Sterling, Heater w/ 3 Outlets, Metal Flake Gelcoat Upgrades & Upholstery Thread Color Upgrade (Hot Orange), Dual Batteries w/ Isolator Switch, Two Pair Pull Up Cleats, LED Docking Lights & Underwater Transom Lights (Blue), Stereo w/ Wake 23 LSV Sound Pack, 12” Subwoofer w/ Amplifier, 2 Pair Wetsounds Icon 8 Tower Speakers (Black), 500w Tower Amplifier, In Boat Speakers, G3.5 Tower (Black) w/ PTM Clamping Board Racks, Ballast Upgrade: Malibu Mid, Rear & Bow Launch System, PNP Plumbing w/ Auto Vent, Power Wedge II, Surf Gate w/ Malibu Surf Band, Fly High Rear 650lb Dual Rear Ballast Bags (Pair). Transferable Warranty on Boat, Motor & Trailer; fees apply. The Command Center is the smartest combination of digital interfaces and traditional controls in the industry. The bright, high-resolution 12-inch MaliView touchscreen gives you finger-tap control of the ballast, Power Wedge II and Surf Gate. Also includes the Sport Dash analog control dial for Surf Gate, Power Wedge II, stereo and speed. Our top-of-line G4 tower is also user-friendly, taking less than 30 pounds of force to easily lift, lower and latch. Also featured on the G4 are our P.T.M. Clamping Spinner Board Racks. Malibu's Soft Grip flooring, transom pads, and swimboard enhances comfort and function. 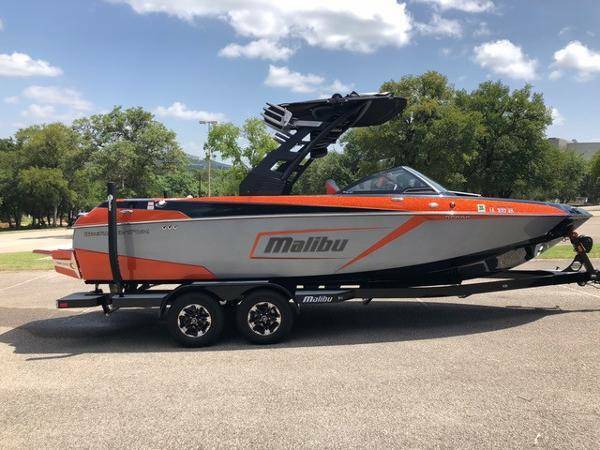 Malibu’s exclusive ISP starts with Model-Specific Performance Hulls, Quad Hard Tank ballast, and Malibu's exclusive Power Wedge II and Surf Gate. Control it all with the touch of a finger using the Malibu Command Center and our exclusive Surf Band wrist remote. CLICK ON THE LINK BELOW FOR MORE INFO AND PHOTOS ON THIS MALIBU!